The influence of original drugs from Scutellaria baicalensis (SB) Georgi (dry extract, powder of rhizomes and roots, tablets “Scutex” on the basis of the dry extract and capsules “Scutella”, which contain powder of rhizomes with roots) was studied on depressive behavior, physical endurance and anti-hypoxic activity in mice. The used dry extract SB (SBDE), powder of roots and rhizomes from SB (SBRP), tablets from dry extract of SB named “Scutex”, and hard gelatin capsules from the crushed root of SB named “Scutella” were obtained from National University of Pharmacy, Department of Industrial Technology of Drugs. In the experiment, 94 random-breed white male mice weighing 20-29 g were used and kept in standard sanitary and laboratory conditions. The experiments revealed that SBDE had anti-depressant action. Powder from rhizomes and roots of SB and “Scutella” capsules had anti-hypoxic action. All test drugs showed no influence on the physical endurance of mice. These results suggest the possible use of SBDE as an anti-depressant drug, and rhizomes with roots and “Scutella” capsules as an anti-hypoxic remedy. SBDE at a dose 50 mg/kg shows anti-depressant activity that exceeds the activity of the comparison drug “Bilobil”. SBDE, SBRP, “Scutex” tablets and “Scutella” capsules do not affect the physical endurance of mice. SBDE at a dose 50 mg/kg and SBRP at a dose of 173 mg/kg and 260 mg/kg exhibit anti-hypoxic activity. “Scutex” tablets show no anti-hypoxic action and “Scutella” capsules cause probable anti-hypoxic action that exceeds the effect of the reference drug “Bilobil”. The creation of new effective drugs based on plant material is relevant and a priority direction of modern pharmacy. Herbal origin preparations have recently become very popular due to the variety of therapeutic effects provided by both individual substances and complex compounds found in plant material. Scutellaria baicalensis (SB) Georgi (Lamiaceae family) is a promising source of biologically active substances. The main biologically active substances of SB are flavonoids and flavonoid glycosides such as baicalin, baicalein, scutellarin, oroxylin, wogonin, apigenin, and others. In traditional Chinese medicine, roots of SB have long been used for hypertension, epilepsy, nervousness, sleep disorders. Recently, the psychotropic and cerebroprotective action of SB drugs has been investigated, including in neurodegenerative diseases, and CNS lesions of ischemic genesis.1-6 It has been proved that preparations of raw SB (dry extract, “Scutex” tablets and “Scutella” capsules) show anxiolytic and anti-amnestic effects.7,8 In view of the above, there is a need for the expediency of comprehensive comparative pharmacological studies of SB dry extract, powder of roots and rhizomes of SB and preparations based on them as potential psychotropic drugs. The purpose of the study was to evaluate the possible anti-depressant properties and anti-hypoxic action of the dry extract, powder of roots and rhizomes of SB and also “Scutex” tablets based on dry extract SB (SBDE) and hard gelatin capsules “Scutella”, which contain powder of rhizomes with roots of SB, on the physical endurance of mice. The results were examined statistically using STATISTICA 8.0 software by evaluating the reliability of differences between the comparison groups using Student’s t parametric criterion in cases of normal distribution, nonparametric Mann-Whitney U criterion in its absence. The difference was considered statistically significant at p≤0.05. Results of anti-depressant activity of SBDE in terms of the immobilization test (tail suspension test) are shown in Table 1. The obtained results indicate that SBDE at a dose of 50 mg/kg increased latent time of frozen mice hanging 1.7 times or by 68% compared with control (p≤0.05); amount of frozen hangs decreased 1.2 times or by 18%; the overall duration of frozen hangs decreased 1.5 times or by 35% (p≤0.05). The reference drug “Bilobil” in a dose of 100 mg/kg increased the latency time of frozen hangs 1.4 times or by 39% (p≤0.05), and total duration of frozen hangs tendentiously decreased 1.2 times. The action of SBDE exceeded the effect of the reference drug “Bilobil” 1.2 times by an increase in latency for frozen hangs. Therefore, SBDE possesses antidepressant action. The next step was to study the anti-depressant activity of SBRP in doses of 173 mg/kg and 260 mg/kg. SBRP in both doses had no significant effect on quantitative parameters of depressive behavior (Table 1). “Scutex” tablets and “Scutella” capsules also showed no probable anti-depressant activity (Table 1). They only biased the increased latent time of frozen hangs and reduced their total duration. On the other hand, the effect of the drug Ginkgo biloba (“Bilobil”) on depressive behavior was weak and unstable, as in the different series of experiments it either increased latency time of immobilization or tendentiionally reduced its total duration, or had no significant effect. 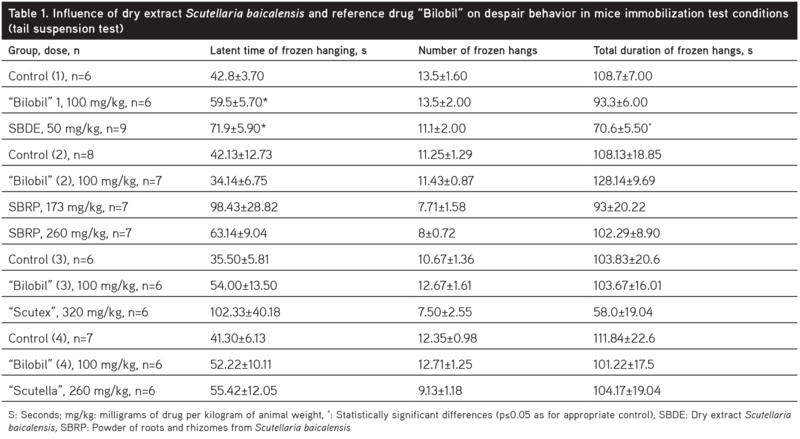 All drugs of SB; SBDE, SBRP, “Scutex” tablets, and “Scutella” capsules, as well as “Bilobil” had no effect on the physical endurance of mice in the test of swimming to exhaustion (Table 2). This was evidenced by the unchanged swimming time compared with the controls. 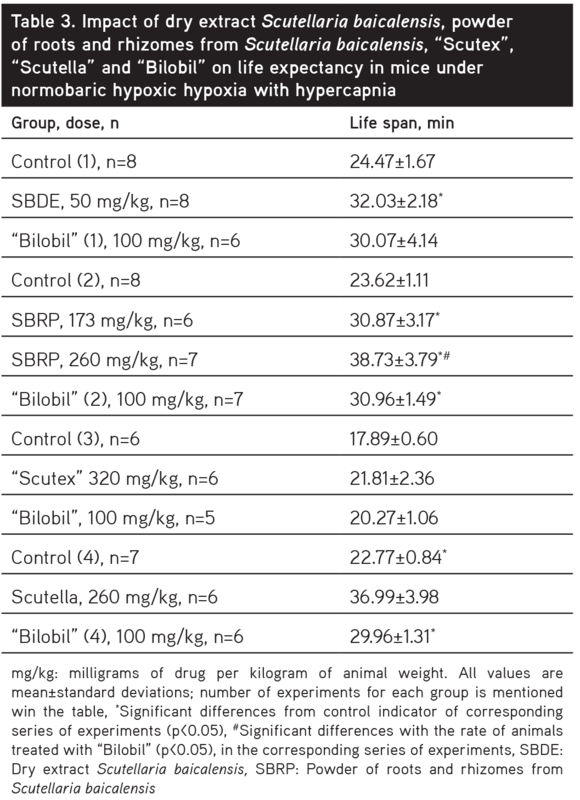 Results of the study regarding the anti-hypoxic properties of SBDE in normobaric hypoxic hypoxia with hypercapnia model demonstrated an increased life expectancy of the mice of 1.3 times compared with the controls (Table 3), indicating a distinct anti-hypoxic effect of the drug. In the group of animals treated with the comparator, no statistically significant differences as compared with the controls were observed. SBRP at a dose of 173 mg/kg significantly increased the life duration of mice by 1.3 times compared with the control. Similar results were observed when the reference drug “Bilobil” was administered. Influenced by SBRP at a dose of 260 mg/kg, the lifespan of the mice increased 1.6 times compared with the controls, which is 33% more than in the background of SBRP at a dose of 173 mg/kg (Table 3). Accordingly, SBRP at a dose of 260 mg/kg has the most significant anti-hypoxic effect in terms of normobaric hypoxic hypoxia with hypercapnia and exceeds the effect of comparison drug, and at a dose of 173 mg/kg SBRP acts at the level of reference drug. “Scutex” tablets only showed a tendency to increase the life duration of mice by 21.9% compared with the controls. “Bilobil” also showed a tendency to increase lifespan of mice by 13.3% as compared with the control group. 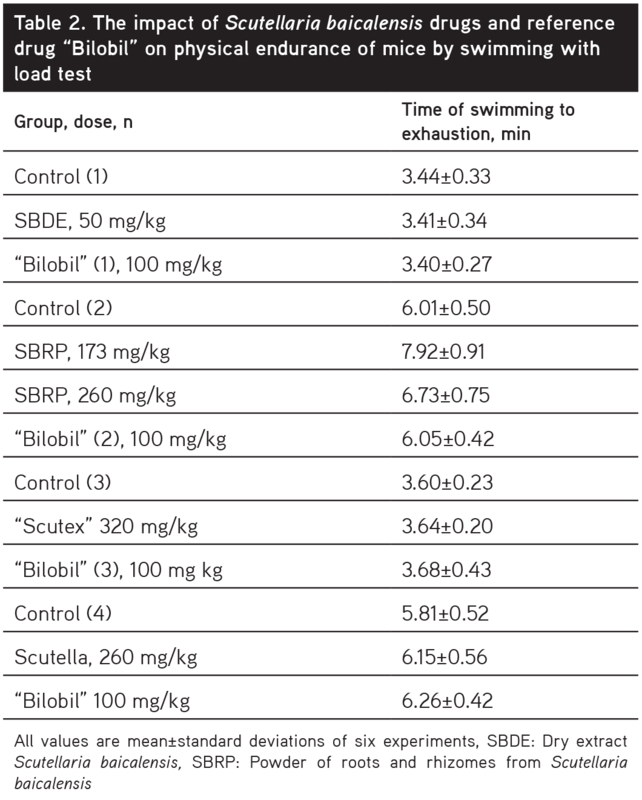 “Scutella” capsules (Table 3) significantly increased the lifespan of mice by 1.6 times compared with the controls. Under the influence of “Bilobil”, there was also an increase in life expectancy of mice of 1.3 times compared with the control group. Thus, we can conclude that “Scutella” revealed anti-hypoxic action and had an advantage over the reference “Bilobil” drug. The anti-hypoxic effect of the latter was not stable, however, because in different experiments it was revealed either on a statistically significant level or biased. SBDE at a dose 50 mg/kg shows anti-depressant activity that exceeds the activity of the comparison drug “Bilobil”. SBRP at doses of 173 mg/kg and 260 mg/kg, as well as “Scutex” tablets and “Scutella” capsules have no anti-depressant action. SBDE, SBRP, “Scutex” tablets and “Scutella” capsules have not effect on the physical endurance of mice. SBDE at a dose 50 mg/kg and SBRP at a dose of 173 mg/kg and 260 mg/kg exhibit anti-hypoxic activity exceeding the activity of the reference drug “Bilobil”. “Scutex” tablets show no anti-hypoxic action and “Scutella” capsules cause probable anti-hypoxic action that exceeds the effect of the reference drug “Bilobil”. Yakovleva GP, Blinova KF. Encyclopedic Dictionary of medicinal plants and products of animal origin. Belodubovskaya GA, Zabinkova NN, eds. St. Petersburg; Utchebnaja kniga; 1999:1-407. Ibrahimova VS. Chinese medicine. Methods of diagnosis and treatment. Pharmaceuticals. Acupuncture therapy. Antares. 1994:426-429. Arnal-Shnebellen B, Goetz P. Encyclopedia of medicinal plants (translated from French). 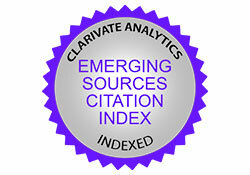 Grassar E, Yunen M, eds. Riderz Daydzhest; 2004:1-352. Shang Y, Zhang H, Cheng J, Miao H, Liu Y, Cao K, Wang H. Flavonoids from Scutellaria baicalensis Georgi are effective to treat cerebral ischemia/reperfusion. Neural Regen Res. 2013;8:514-522. Lu JH, Ardah MT, Durairajan SS, Liu LF, Xie LX, Fong WF, Hasan MY, Huang JD, El-Agnaf OM, Li M. Baicalein inhibits formation of a-synuclein oligomers within living cells and prevents Ab peptide fibrillation and oligomerisation. Chembiochem. 2011;12:615-624. Xiong Z, Jiang B, Wu PF, Tian J, Shi LL, Gu J, Hu ZL, Fu H, Wang F, Chen JG. Antidepressant effects of a plant-derived flavonoid baicalein involving extracellular signal-regulated kinases cascade. Biol Pharm Bull. 2011;34:253-259. Slipchenko GD, Shtrygol SY, Kudina OV, Taran AV, Ruban OA. The comparative pre-clinical study of psychotropic properties of the medicines from Scutellaria baicalensis Georgi. Pharmacology and Drug Toxycology. 2016;4-5:41-49. Shtrygol SY, Slipchenko GD, Kudinov AV, Matviichuk AV, Ruban OA. 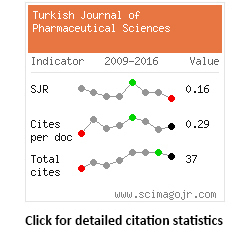 Comparative clinical trials of antiamnestic properties of Scutellaria baicalensis drugs. Phitoterapiya Chasopis. 2016;4:17-20. Tsyvunin VV, Shtrygol SY, Prokopenko YS. Neuroprotective properties of dry extracts of Fumaria schleicheri and Ocimum basilicum. Reviews on clinical pharmacology and Drug Therapy. 2013;11:66-71. Stefanov OV. Preclinical study of drugs (1st ed). Kyiv; Avitsena; 2001:1-528. Mironov AN. Guidance on conducting the preclinical studies of pharmaceuticals. (1st ed) Moscow; Griff & Co; 2012:1-944.